This article aims to introduce you a simple GUI utility – VeryPDF Screen OCR, which is also named desktop capturer designed for Windows users to capture desktop with OCR technology immediately. 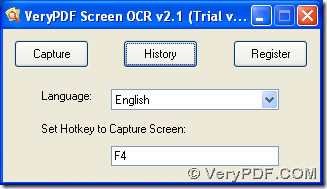 VeryPDF Screen OCR is one of useful tools at VeryPDF, which is a simple-operate GUI tool that helps you capture desktop with OCR technology in both 32 bits and 64 bits Windows systems. Through VeryPDF Screen OCR, extracted text of desktop can be searchable and editable flexibly as you wish. With the help of easy-to-use GUI interface, Windows users can fulfill flexible method to capture desktop through OCR technology. You can try free VeryPDF Screen OCR here, too. VeryPDF Screen OCR technology allows you to run conversions in multiple languages, e.g., English, Greek, Vietnamese, Chinese, Bulgarian, German, Italian, Spanish, French, Danish, Portuguese, Catalan, Hungarian etc. click left button of mouse continuously, meanwhile you need to draw a rectangle on where you want to capture on desktop, then after you drop your left button, a rectangle can be formed along with 4 buttons appearing. 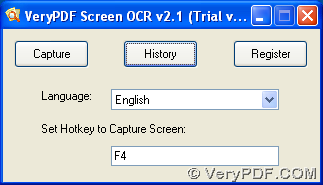 To save captured screen in your computer, you need to click Save to file, then you can find this capture in default folder of VeryPDF Screen OCR in your computer; to copy this snapshot, please click Copy, then you can paste it in where you want to place it. Then, you need to click OCR so that VeryPDF Screen OCR can help you capture desktop in your own selected zone with OCR technology and extract characters in it into text quickly. After you get panels like the following picture here, you can notice the apparent characters extracted onto text preview panel automatically and accurately. At last, text file saved can be editable and searchable conveniently. If you have any questions on this desktop capturer – VeryPDF Screen OCR and how to capture desktop with OCR technology, it is convenient for you to contact our support team of VeryPDF. Thank you for your support here. Is there a great way to OCR snapshot?